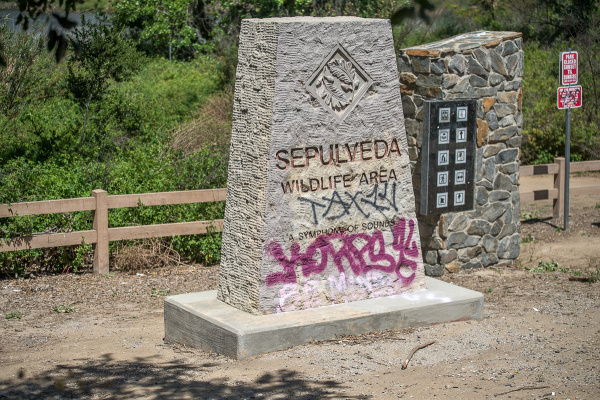 WILD THINGS: Sepulveda Basin is an urban wildlife refuge. More than 200 types of birds have been recorded in the entire basin, hence the “Symphony of Sounds” moniker. 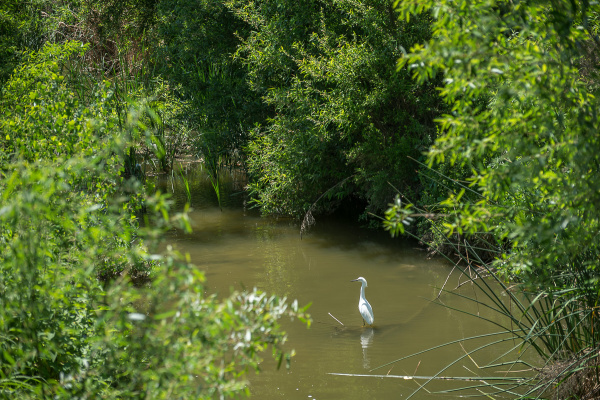 A modest green has returned to the Sepulveda Basin’s South Reserve – but many of its former wildlife residents have not. 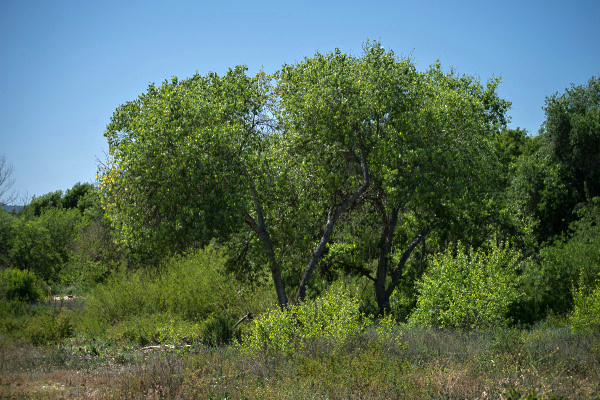 It’s been nearly 2 ½ years since the Army Corps of Engineers unceremoniously ripped apart and plowed over 48 acres of the wilderness area that’s nestled in the traffic-laden corner between the 405 and 101 freeways. After the initial media uproar that involved politicians, environmental groups and local citizens, the dust seems to have settled on the landscape that once welcomed numerous birds including the California thrasher and the endangered least Bell’s vireo. But no more. At a recent bird walk through both North and South Reserves, Kris Ohlenkamp from the San Fernando Valley Audubon Society says he recorded 63 species of birds, but only 5 were spotted in the South Reserve. Today, young cottonwoods and box elders are regaining the ground and much of the overturned land is now covered with plant life, including native species. Butterflies and bees scour the offerings, but bird songs that are noisily heard non-stop in the North Reserve are strangely intermittent here. GREEN GREEN: But where are the feathered singers? Indeed, many feathered residents that once took up nest in the South Reserve have been spotted now in the North, including about six pairs of California thrashers and three pairs of least Bell’s vireos. Sure, here hummers zip through the sky, yellow warblers carry a solitary tune to a nearby tree, song sparrows dart among the branches. Down at the confluence of the creek to the L.A. River, you can spy all kinds of shorebirds. But there is a decided….emptiness…to the South Reserve that you can’t quite put your finger on. There have been many discussions about the original 1981 Master Plan for the South Reserve that includes a proposed pond, lake and winter seasonal marsh. The pond was previously dug, but never filled with water. 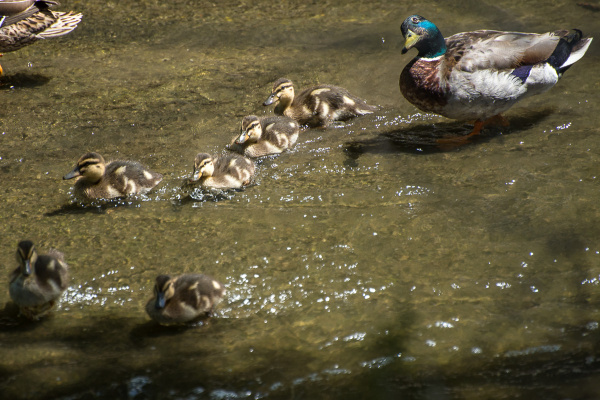 YES, WE’D LIKE A POND IN THE SOUTH RESERVE: Mallards at the waterway in the North Reserve watch over youngsters. What Ohlenkamp and company are specifically waiting on is a Vegetation Management Project which would outline how the Army Corps plans to care for and maintain these acres. Despite that, Ohlenkamp is happy that groups are being invited to the Army Corps table to discuss the future of the South Reserve. “They have kept us involved and listened to us, their attitude has changed, but we get the feeling we are not a priority for them,” he says. That might be the rub. After all, the Corps is involved in a myriad of other high-profile projects including a storm damage reduction project in Encinitas-Solana Beach and the very popular Los Angeles River Ecosystem Restoration Feasibility Study. The official word from the Army Corps on Sepulveda Basin’s Vegetative Management Project is that it is “nearing completion” as is the Environmental Assessment. Maybe that’s what’s missing from the walk in the South Reserve. A sense of movement. A flurry of wildlife activity, a bustling of busy-ness that comes from nature fully alive. There’s no question that the South Reserve has adjusted from its earlier trauma but it’s certainly not flourishing like the nearby North Reserve. These are, in essence, fallow acres waiting for the bureaucratic stars to align. Just like certain seeds that can wait for years for the right mixture of water, sun and time to finally sprout, so goes the South Reserve. So for the time being, nature waits alongside those humans who are connected to Sepulveda Basin, all anticipating a day when birds will once again fill the wild landscape with nests and songs. BIDING TIME: Snowy egret in Sepulveda Basin’s Haskell Creek.